The S.C. Department of Natural Resources (DNR) and the Pee Dee Scenic River Advisory Council are asking for public input to help develop a management plan for two designated State Scenic River sections of the Great Pee and Little Pee Dee. The public is invited to share ideas and opinions regarding the management needs of these rivers through a survey which can be accessed online. The survey is available to the public through the date of June 30, 2014, and may be accessed online at this Survey Monkey website. Both of these State Scenic River sections, which extend below U.S. Highway 378, have long been recognized for their outstanding ecological, cultural, and recreational values. 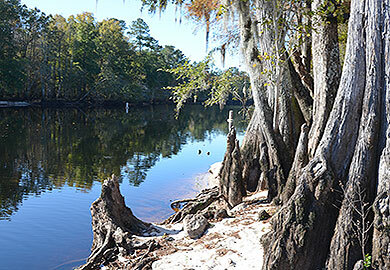 This led to their designation as State Scenic Rivers by the South Carolina General Assembly. In 1990, the lower portion of the Little Pee Dee, from US Highway 378 to its confluence with the Great Pee Dee, was designated as a Scenic River. In 2002, the 70-mile section of the Great Pee Dee from US Highway 378 down to Winyah Bay was also designated a Scenic River. The proposed management plan will serve as a guide to protection and improvement of the two rivers. The 16 question survey will gather data and opinions from local citizens who use and enjoy these rivers and define what issues need to be addressed in a management plan. This input will enable DNR staff, to focus on what users value about the rivers, what they perceive as threats, what they see as opportunities, and what can be done to better protect and enhance the rivers and the surrounding uplands. Public input is required to ensure the management plan accurately represents the interests, views, and concerns of the local community. The Pee Dee Scenic River Advisory Council was formed to assist and advise the DNR on the management of these two scenic rivers. The advisory council includes 19 members who represent river-bordering landowners, local river users, and community interests related to the rivers. The role of this council is to guide Scenic River Program activities for these two rivers including the development of the proposed Pee Dee Scenic River Management Plan. What is a State Scenic River? The South Carolina Scenic Rivers Act allows the General Assembly (legislature) to designate certain special rivers (or river segments) as State Scenic Rivers. Currently, there are 10 State Scenic Rivers in South Carolina. State Scenic Rivers are recognized as having unique or outstanding scenic, recreational, geologic, botanical, fish, wildlife, historic, or cultural values. How is a Scenic River Management Plan to be used? The DNR's Scenic Rivers Program is not a regulatory program, and a Scenic River Management Plan does not create new regulations. Instead, the plan serves as an public informational guide to the river, to be used by the Pee Dee Scenic River Advisory Council to promote partnerships, policies, and actions that will serve to protect and improve the river consistent with community values for the river. Bill Marshall is the DNR program manager and member of the Pee Dee Scenic River Advisory Council, and Bill can be reached by telephone at 803-734-9096 or email at marshallb@dnr.sc.gov to address questions about this project.